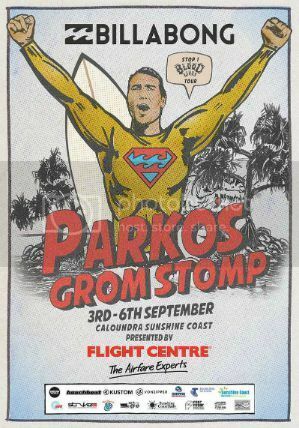 2015 Billabong Parko Grom Stomp runs Sept 3rd - 6th at Caloundra on the Sunny Coast. Small but fun waves will be on offer with moderate Northwest winds forecasted for day 1 when the frothing grommets hit the water in the Under 10 and 11 divisions and surf right through to their finals. Good luck groms. A great start to the event for the Le-Ba groms in 2ft A-frames at Caloundra’s Ann Stree. Dembe Ryan won the U10's after dominating the early rounds. Harry O'Brien won the Plate round of the U10's. In the U11's Jack O'Brien finished 4th and Masa Leishman was 7th. After ripping her way through the early rounds Nyxie Ryan had to settle for 4th in the 12 Girls. Jack Murray finished 9th in the U16's.